By the time you read this, my watch as Wildlife and Freshwater Fisheries Director will be over. After 35 years in state government, with more than 12 as director of Wildlife and Freshwater Fisheries, I’ve made the decision to move on to new endeavors. Our hunting heritage is highly important to all of us who hunt. Even to those who do not hunt, hunting is a very positive economic and societal force in Alabama. The Hunting Heritage Foundation, a non-profit corporation, has been formed for the express purpose of standing up for hunting. The Board members, people of integrity and vision, are deeply committed to keeping hunting opportunities available for all Alabamians. A separate grassroots political organization, HUNT Alabama (Hunters United Now Tomorrow), also a non-profit corporation, has been formed to provide a voice in the Alabama legislature on hunting-related issues. Serving as Executive Director for both, I will devote my time and efforts to protecting and perpetuating our hunting heritage. This is something I feel very strongly about. My grandfather and parents’ friends introduced me to hunting at a young age. All through the years, as I return the kindness by passing the heritage along, hunting continues to enrich my life. The trends and patterns I’ve seen as Wildlife and Freshwater Fisheries Director are troubling. We have all watched narrow special interests essentially stiff-arm the common man out of the way on hunting issues. Yet most of our hunters are the “common man.” Most are not affluent or otherwise advantaged. Statistically, the vast majority of our hunters are not in the wealthy category. Most are not highly experienced or strongly committed. Most only hunt sporadically. But the hunting license purchased by the mill worker or logger or construction worker funds wildlife management and protection exactly the same amount as the license purchased by the wealthiest businessman in the state. And at the polling place, the common man’s individual vote counts exactly the same as the rich man’s. Don’t get me wrong. My friends come from all walks of life—some affluent landowners and some dirt-poor. They are all important as the community of hunters, and maintaining our broad base is critical. Think about it. While we’re fighting one another, the anti-hunters sit gleefully giggling on the sidelines. Look for more to come on how we can combat these and other issues. 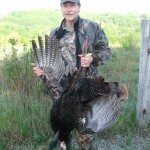 A Hunting Heritage column will be published monthly. Thank you from the bottom of my heart for allowing me the privilege of working a long time for the best state fish and wildlife agency in the country. After 35 years of public service, it would be understandable if Corky Pugh took that cliched route of disappearing into the sunset. Yet, for those who know the recently retired Wildlife and Freshwater Fisheries Director, they realize it’s not his style. Instead Pugh will maintain his public presence through a pair of entities that will promote the hunting legacy of Alabama, as well as being an advocate for the average hunter in the state. Pugh has established the Hunting Heritage Foundation to spread the word about how important hunting is to the fabric of society in Alabama. “The foundation will be a positive voice for hunting in terms of helping people understand the significance of hunting, both societal and economic,” Pugh said. “Most people don’t know that hunters have paid for management and protection of wildlife resources for 75 years. And those wildlife resources are enjoyed by everybody, whether they hunt or not. Pugh said a recent U.S. Fish and Wildlife survey indicated that the economic impact just from the hunting side of the equation in Alabama is $1.4 billion annually. Hunters account for $847 million in direct retail expenditures. That generates $83 million in state and local taxes. “But it’s way beyond the economic impact,” he said. “If you ask citizens about things that are important to them, knowing there are healthy wildlife populations is important to people in general. A lot of people think that their tax dollars are paying for managing and protecting wildlife, but they’re not. If not for those hunter-generated funds, there wouldn’t be the 761,000 acres of public access throughout the state in 37 Wildlife Management Areas (WMAs). Pugh said he plans to accomplish this outreach and education in a number of ways. “There will be a website for the foundation,” he said. “I intend to write a monthly column, plus articles on a regular basis. I’ll probably go on a speaking tour. The audiences that are out there, whether they be business people or school children or anybody in between, it’s really important for all those folks to understand the contributions that hunters make through the purchases of licenses and those excise taxes. During Pugh’s tenure at Wildlife and Freshwater Fisheries, the youth outreach included youth dove hunts, a model nationally for the recruitment of young hunters. Researcher Mark Duda singled out the Alabama youth dove hunts for special recognition as a tool for recruitment and retention of hunters. Special youth hunts are also held on WMAs, and the special youth deer and turkey seasons were expanded during his 12 ½ years as director. 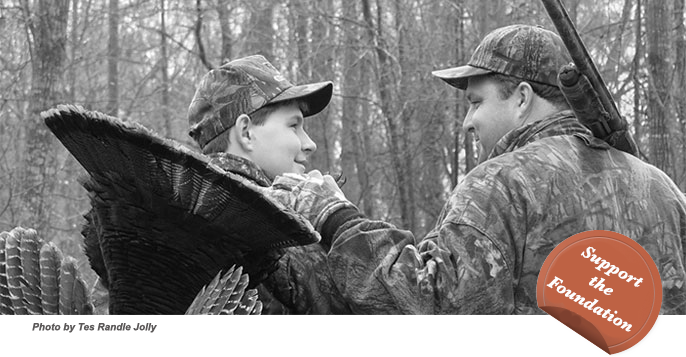 Pugh said as the foundation grows there are plans to provide funding for youth hunting events. The other vehicle Pugh will use to further his efforts is HUNT Alabama. “HUNT stands for Hunters United Now Tomorrow,” he said. “The purpose is to establish a grass roots political entity with which to lobby for sound public policy on hunting issues. Neither of these is going to be membership based, as far as people paying fees to belong to something. Another of Pugh’s major goals is to do everything possible to unify the hunting community to ensure a solid front against those groups who would limit hunting activity. “Hunters have an unhealthy tendency to divide up into factions,” Pugh said. “It’s kind of like what David Keene of the NRA (National Rifle Association) said: ‘Bird hunters don’t like the deer hunters. The deer hunters don’t like the bird hunters. And the turkey hunters don’t like anybody.’ That’s true to some extent. Pugh said that it’s a little premature to talk about specific legislation that might or might not come up in the 2012 session of the Legislature or during the fall election cycle.